Nothing can make you lose your cool quite as fast as faulty air conditioning, so when it comes to beating the heat, don’t sweat it; we are experts at auto air-conditioning. We are the only mechanics in Toowoomba who have the equipment and training to use HFO1234F refrigerant. From standard vehicles to work related and prestige cars, we service all makes and models. We don’t stop at a service, we provide best practice advice for maintaining your air-conditioning. At Automotive Assist Service Centre, we provide auto air-conditioning services and repairs for whatever you drive; family cars, 4WD’s, trucks, utes and prestige vehicles – we have it covered. When it comes to auto air conditioning, don’t wait for a problem to arise, we recommend an annual service to ensure that your vehicle’s air conditioning is always performing at its best. This service will typically require the gas and filter to be renewed. Failing to regularly maintain your vehicle’s air conditioning gas and filter will not only end up hurting your back pocket with more extensive repairs, but running your car while knowingly leaking gas is illegal and hurts our environment. 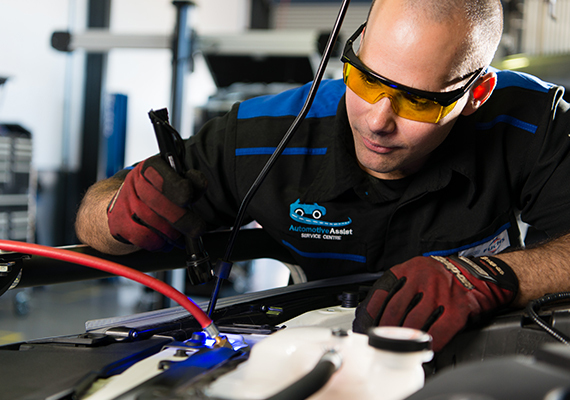 To provide you with the best auto air conditioning that keeps both you and the planet cool, we use R134A refrigerant, and are the only auto repair centre in Toowoomba with the equipment and training to use HFO1234YF refrigerant which is known to be more energy efficient and ozone friendly. And it’s not just the health of the planet at stake; failure to regularly maintain your auto air-conditioning can result in your car air-conditioning becoming a breeding ground for bacteria and fungus which is a major concern for sufferers of asthma and other allergies. So breathe in the fresh air, speak to our experienced auto air-conditioning technicians about an anti-bacterial air-conditioning service today.